Manhattan’s Lower East Side has long been home to a substantial Jewish population, and Susan Sandler’s “Crossing Delancy” takes us there in June of 1985 to witness a tradition handed down through the generations. To remedy the situation, Bubbie contacts Hannah Mandelbaum (Nora Rousso), the local shadkhn (matchmaker). 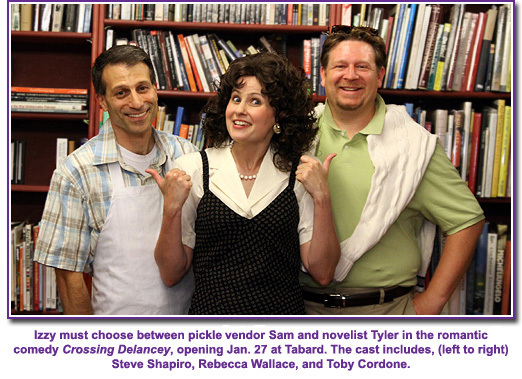 Hannah arranges an introduction to Sam (Steve Shapiro), a pickleman and a nice Jewish boy who needs a wife. Izzy is infatuated with Tyler Moss (Toby Cordone), a local author who frequently comes by the shop to check his book sales and to buy some “specialty periodicals”, though Izzy peers at him through rose colored glasses (or lighting effects), blind to his extreme narcissism. And so goes the story with Izzy caught between her star struck dream and the reality of a nice Jewish boy who is smitten with her. As one might imagine, this can make for some charming romantic comedy. This is a family production with Tabard’s Executive Director Cathy Spielberger Cassetta serving as both producer and director, and her husband, Joe Cassetta providing technical direction, interesting considering the lead character’s apparent aversion to marriage. From the top of the show when we first meet Bubbie, Griffith captures the tone, inflection, and bearing making a very convincing European-born Jewish grandmother, accent and all, who clearly loves her granddaughter. She and Wallace have wonderful chemistry and their interactions are both amusing and believable as they playfully spar over the trajectory Izzy’s life seems to be taking. Wallace has to walk a careful line, never appearing resentful or hostile toward her bubbie’s interference, yet simultaneously seeking some space to maintain her independence. She smoothly moves from direct interaction with fellow actors on stage to musings directed at the audience as she explains what she’s thinking. It’s interesting watching Wallace’s Izzy navigate the waters as she sails through rivers of romance, crossing Delancy to traverse paths both traditional and modern, or at least as modern as 1985. Rousso’s Hannah is annoying, though she’s supposed to be. While she nails the wheeler-dealer aspect of her character and hits the right level of forcefulness of manner, she is a bit too shrill in speech. Shapiro is interesting. As Sam, he’s at first a bit shy and has that innocent, “boy next door” appeal with a gentle mien and heartfelt line delivery. The only negative in his performance is his constant mugging, though his chemistry with both Wallace and Griffith almost negates that. When he warmly tells Izzy “you should try on a new hat sometime, it might look good on you,” while not immediately obvious, it’s the perfect ending to their first meeting. Cordone’s Tyler captures his character’s self absorbed carriage well, though he’s a tad mechanical and appears younger than he is written. His character’s abrasiveness makes the audience wonder when Izzy will see around the filter of her fantasy. The set is compact and fits in the Tabard performance space well. Four distinct areas are evident including a bookstore stage right with its bookcases and desk; Bubbie’s kitchen stage left complete with a kitchen window, and of course the front door with the requisite five locks to keep Bubbie safe; a park bench in front of downstage center right; and a restaurant table and chairs in front of downstage left. The action logically transitions easily between the areas. Sound designers John Palmer and Joe Cassetta incorporated a lush recorded soundtrack with music composed and arranged by Robert Dennis perfectly adding that element of light klezmer so often associated with Jewish culture. Never overpowering, piano with clarinet or sax accents finish the lighter moments and scene changes adding just the right color. Though an intimate venue, the actors use mics to compensate for some sound irregularities in the space, and the balance this time around is quite good. At times, there’s some slight directional distortion in a few scenes when the action is occurring on the opposite side of the stage from the speaker feed, but that’s also dependent on where one is sitting. Beric Dunn’s lighting design works well, with area lighting for the four primary locations and quick changes to spots when Izzy delivers her musings. The rose colored fantasy lighting is particularly striking. Tabard adds some nice touches to the program as well, providing the audience with a short Yiddish-English glossary of terms used in the play as well as some quick 1985 pop culture references to remind us of the time. In all, Tabard’s “Crossing Delancy” is an upbeat and enjoyable evening’s entertainment. When: Continues through 19 February Thursday (16 February only), Fridays and Saturdays at 8PM, Saturdays at 3PM, and Sundays at 2PM. Info: See www.tabardtheatre.org or call 800-838-3006.